Something to do with Bunnies, pyramids, top hats and martinis. Topiary confesses she doesn't understand this cryptic graffiti, but applauds it's understated elegance nonetheless. well if topiary can't crack the code, I sure can't! 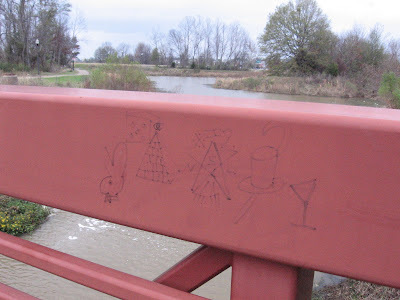 Something tells me the martinis had a LOT to do with that graffiti. Sandi, your deep understanding of the human condition has rendered Cow moo-less!